As soon as the weather begins to turn warm, we are outdoors as much as possible. Being in the South, we are not ones for the cold, but we do love being outside. Not to mention, with our new patio set-up, Colby also made sure to upgrade his outdoor fire pit. Guess what the kids wanted the very first night? 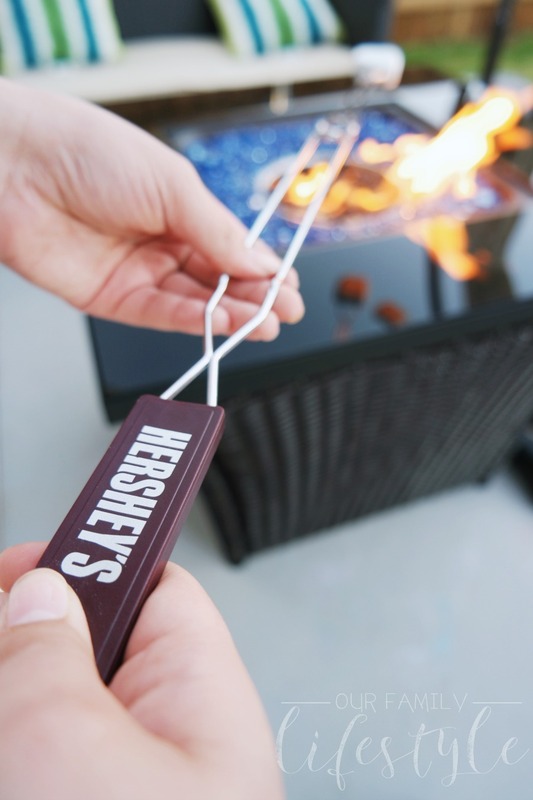 HERSHEY’S S’Mores, of course! 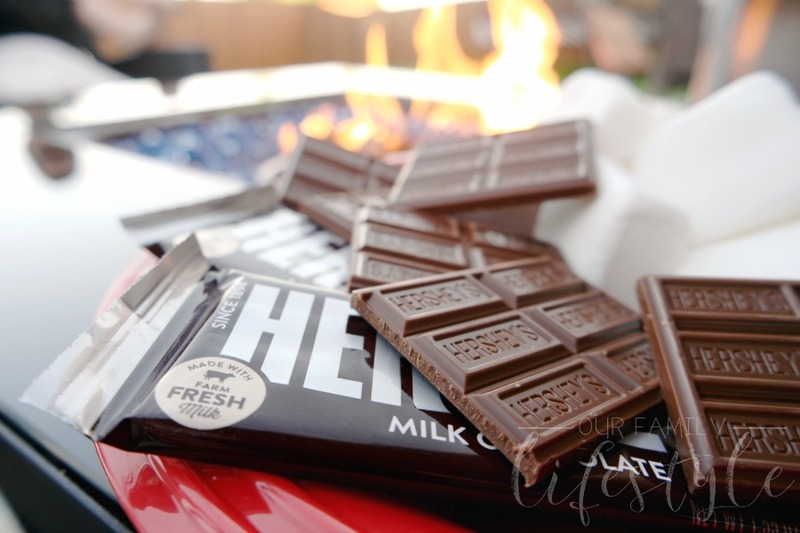 HERSHEY’S Milk Chocolate is made with familiar ingredients, such as cocoa and sugar, plus it has no artificial flavors, preservatives or sweeteners. Therefore, when the kids ask for it, we have no worries about obliging. I mean, we love the creamy chocolate goodness as well, so why would we argue with them? HERSHEY’S Milk Chocolate begins with farm fresh milk that is delivered daily to their factory in Hershey, Pennsylvania. Each of the dairy farms supplying the milk are within 100 miles of the factory, so you know it’s fresh. In fact, did you know that Hershey is one of the few large-scale chocolate makers in the U.S. to use farm fresh milk in HERSHEY’S Milk Chocolate? That’s right… in every delicious HERSHEY’S Milk Chocolate! You can check out this video to learn more about the farm fresh milk that goes into HERSHEY’S Milk Chocolate. It’s that fresh milk that helps give our favorite HERSHEY’S Milk Chocolate the delicious, creamy taste we all know and love. 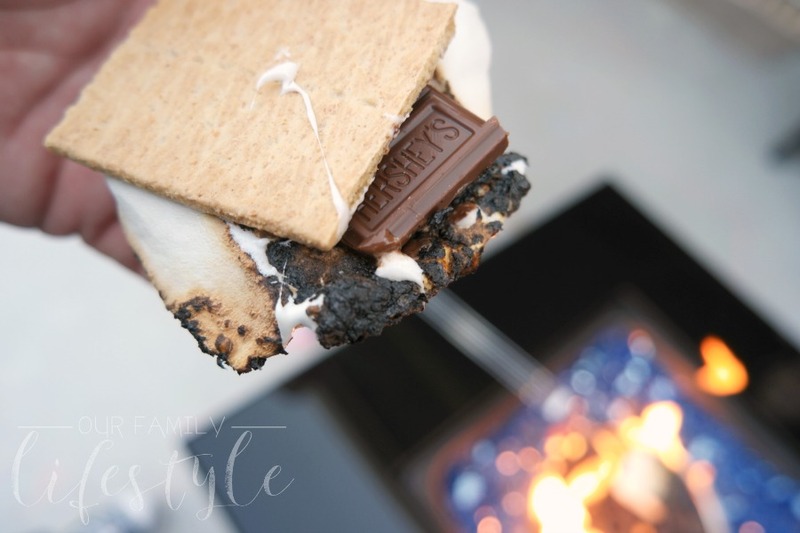 When we make S’Mores over an open-fire with our kids, they can’t wait to slide the toasted marshmallows onto a graham cracker topped with pieces of HERSHEY’S Milk Chocolate. Once the warmth of the marshmallow begins to melt the chocolate into smooth, creamy goodness, you just can’t help but drool. Right?! But beyond the S’Mores, there are the laughs, stories and memories made. As we sit around the fire roasting our marshmallows and putting together our campfire treat, we create images in our minds to hold onto forever. We bond over the laughs we share and the events of the evening. There is no greater joy as a parent than to be able to sit and enjoy the company of your children. And we do. All of us. We are able to joke around with each other in jest and be better for it. We laugh and giggle until our stomachs hurt and laugh wrinkles are well-defined. Oh, and if it’s too cold or wet to have a campfire, we can always enjoy the delicacy indoors as well. Preheat your oven to 350°F and grab a cast iron pan. Line the bottom of the pan with graham crackers. 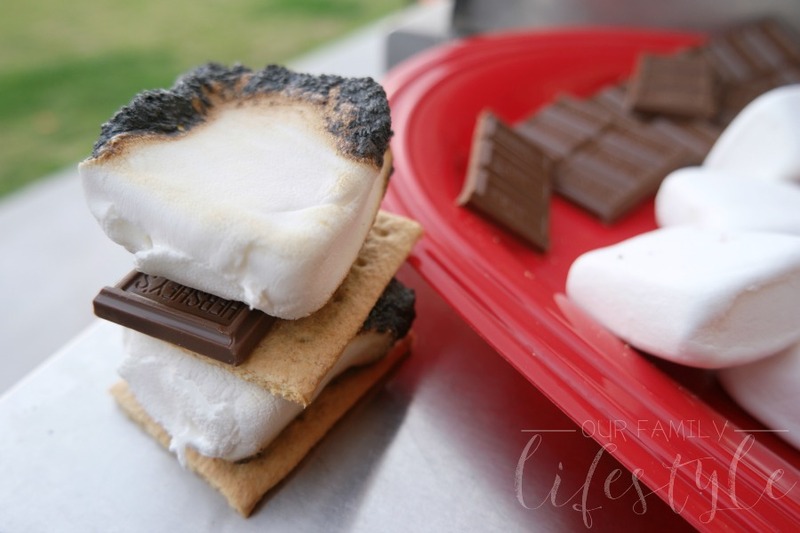 Layer the marshmallows on top then bake for 10 minutes, or until marshmallows are golden brown. Remove from the oven and top with melted HERSHEY’S Milk Chocolate (a quick 30-60 seconds in the microwave should melt the bar easily). 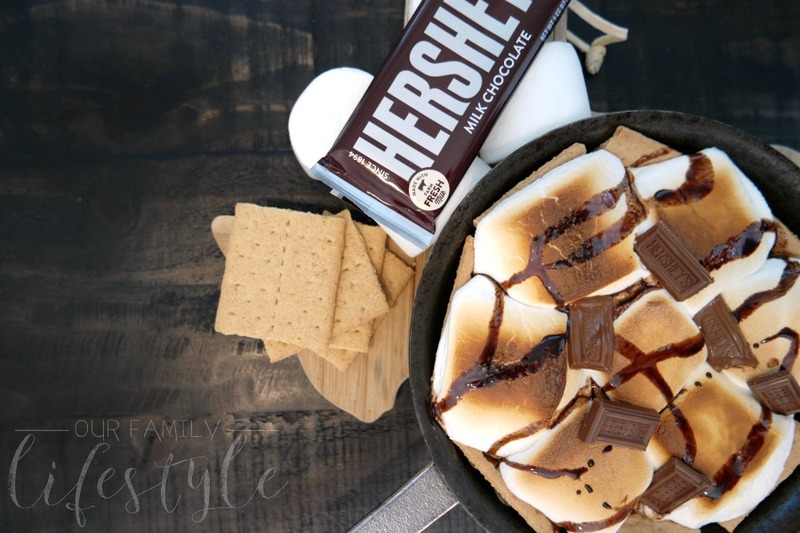 After drizzling the melted chocolate, go ahead and add a few extra pieces of HERSHEY’S Milk Chocolate and then dig in to your S’mores Pie! We have found that it’s in these moments that the best of our days are represented. A simple treat paired with the love for each other can create attachments that last a lifetime. Ready to create your own chocolaty treat? Visit FreshMilkChocolate.com to learn more about the farm fresh milk and simple ingredients that go into HERSHEY’S Milk Chocolate.